Written by MV on 31 October 2017 . In September 2015 physics and astronomy researchers around the world celebrated the discovery of gravitational waves, produced by the merger of two black holes at the centre of the galaxy. This exciting discovery was shortly followed by other 3 confirmed gravitational wave events and by the observation in August, for the first time ever, of the merging of two neutron stars. This was the result of an important collaboration between the American and Italian interferometers LIGO and VIRGO. We interviewed Antonella Bozzi, Head of the IT Department at EGO, the European Gravitational Observatory consortium founded by the National Institute for Nuclear Physics (INFN) and the National Center for Scientific Research (CNRS) to build and manage the site of Virgo interferometer. She explained how this important international collaboration works and which is the role that the Italian research network plays in the data exchange between the involved sites. Can you explain the reason of this collaboration and the way it is organised? When it comes to data analysis, LIGO (with two interferometers in the states of Louisiana and Washington) and VIRGO (with the Italian interferometer in Cascina) are a unique collaboration that shares analysis algorithms, software development, data management, analysis and computing resources. It is physics itself that requires a global approach. Moreover, in order to locate the source of gravitational waves and to analyse their signal, it is crucial to have at least 3 detectors at a certain distance from each other. Lastly, in order to reduce the rate of false alarms, it is crucial to work in multiple coincidence. For this reason, VIRGO puts together the computing centres of CNAF in Bologna, CCIN2P3 in Lyon, Nikhef in Amsterdam and other resources in Poland. Thus, the computing and storage facility is shared through the GRID infrastructure, functioning on top of GÉANT and the European NRENs, which is available to both LIGO and VIRGO researchers. CNAF and CCIN2P3 also act as final repositories of our raw data. Analysis is therefore a "global" analysis, which means that there is a continuous transfer of data between VIRGO and LIGO and vice versa, so that it is possible to split the computational load between the distributed computing resources in the various laboratories and computing centres. In relation to VIRGO, there is a whole networking, storage and computing infrastructure that supports experimentation for data analysis. This type of analysis is also made with data coming from LIGO when the American interferometers are on, because some pipelines (i.e. data analysis processes, researching different events according to various theoretical models) run just in our farm. In any case, regardless of which interferometer is on or off, we always have a very heavy transfer of raw data, with over hundreds and hundreds of channels to be analysed. What is the impact of such a dense exchange of data from the networking and computing perspective? We use heavily both the network and the computing centres. For example, not only we have data going from Cascina to the United States and from the United States to Cascina in real time, but also from Cascina to the Italian and French computing centres, with a latency of a few seconds, where offline analysis is done From this point of view, a reliable, secure and fast network is a key asset for our collaboration. Thanks to the high performance research and education networks we can share large amount of data in real time and with high levels of security all over the world. In particular, for us the real-time exchange of data is really strategic because each interferometer has its own alert system. If there is something “above threshold” in the data (which means that the signal may have the characteristics to be a gravitational wave), we give an alert to point X-ray detection satellites, optical telescopes, or radio telescopes in a certain area of ​​sky. That is why both the speed in receiving the data and the speed in sending the alert are required. 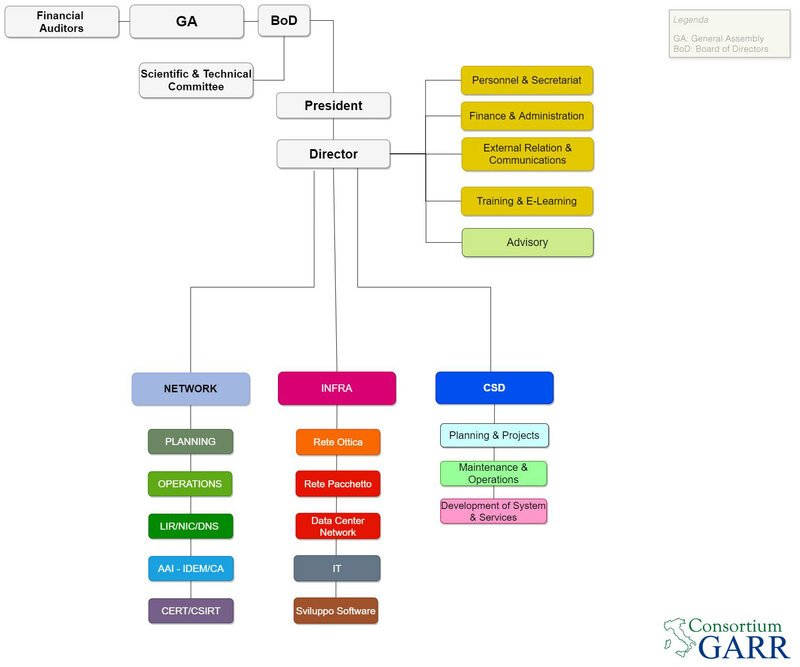 We joined the community of the Italian research network, GARR, in 2004, and this led to a complete change in our network. We are very happy of this collaboration and we currently use an access fibre provided by the University of Pisa (which has a collaboration agreement with GARR) that allows us to first enter GARR network and, from here, to reach the GÉANT European Research Network and the international research networks. What is the data throughput of the experiment? It's about 36 Megabytes per second, but will probably increase to more than 40MB/s because we are in a commissioning phase so we have to analyse all kinds of channels. That is why when we perform a six-month or nine-month run, as we expect to do next year, we’ll need something like 50% more of computing capacity and something like 30% more of archive capacity. In relation to the scientific data capture, when the sensitivity will be consolidated we will hopefully drop to 30MB/s, of data to be archived for a longer period. Last August, for the first time ever, scientists have spotted both gravitational waves and light coming from the same cosmic event. How will the discovery of the gravitational waves change the astronomy? The discovery was made using the detectors LIGO and VIRGO and some 70 ground- and space-based observatories. We can say that this discovery initiates the era of "multimessenger astrophysics," which promises to reveal exciting new insights about the Cosmos. In fact, thanks to the different signals coming from the same cosmic event, both observatories and detectors can observe the same phenomenon and get different information. A new era of astronomy has begun, in which the exchange of data both reliably and in real time becomes strategic as well as the role of the education and research networks to make this really happen. The Nobel Prize in Physics 2017 was awarded to Rainer Weiss , Barry C. Barish , Kip S. Thorne (all of them members of Ligo/Virgo collaboration) for decisive contributions to the LIGO detector and the observation of gravitational waves, which were predicted by Albert Einstein a hundred years ago. They came from a collision between two black holes. It took 1.3 billion years for the waves to arrive at the LIGO detector in the USA. 1-11-2017 - CONN​​​ECT: "Ligo and Virgo - Another success for global R&E collaboration"